In the literature that spans political science, political economy, and policy science, a large number of questions about processes of change remain unanswered, particularly about how agenda setting, decision making, and implementation occur. Thus, there is little theory to explain how issues of reform come to the attention of government decision makers or how reform of policies and institutional arrangements becomes part of their agenda. Even less is known about how policy elites weigh the often urgent and well-articulated advice they receive about policy and institutional changes, their own intellectual [p4] and political views about such changes, and economic and political pressure to alter policies, against equally pressing concerns about the impact of their decisions on existing political and bureaucratic relationships. The factors that affect whether policies will be pursued, altered, revised, or sustained after they have been decided upon are also generally left unexplored because implementation and sustainability are often considered to be matters of effective administration, not political processes. Merilee Grindle and John W. Thomas (1991), Public Choices and Policy Change: The Political Economy of Reform in Developing Countries, p. 3-4. Here’s some beautiful writing from Max Weber on how the validity of social science is rooted in the values and meaning that we attach to it. The objective validity of all empirical knowledge rests exclusively upon the ordering of the given reality according to categories which are subjective in a specific sense, namely, in that they present the presuppositions of our knowledge and are based on the presupposition of the value of those truths which empirical knowledge alone is able to give us. These value-ideas are for their part empirically discoverable and analyzable as elements of meaningful human conduct, but their validity can not be deduced from empirical data as such. The “objectivity” of the social sciences depends rather on the fact that the empirical data are always related to those value-ideas which alone make them worth knowing and the significance of the empirical data is derived from these value-ideas. 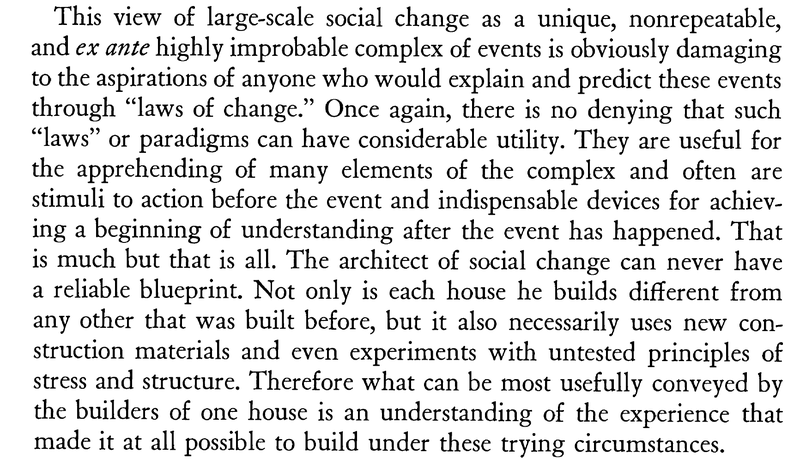 And while you puzzle over what makes empirical data “worth knowing” I leave you with Weber’s own celebration of a complex reality that social science can only order if it has a clear purpose. concrete form in which value-relationship occurs remains perpetually in flux, ever subject to change in the dimly seen future of human culture. The light which emanates from those highest value-ideas always falls on an ever changing finite segment of the vast chaotic stream of events, which flows away through time. 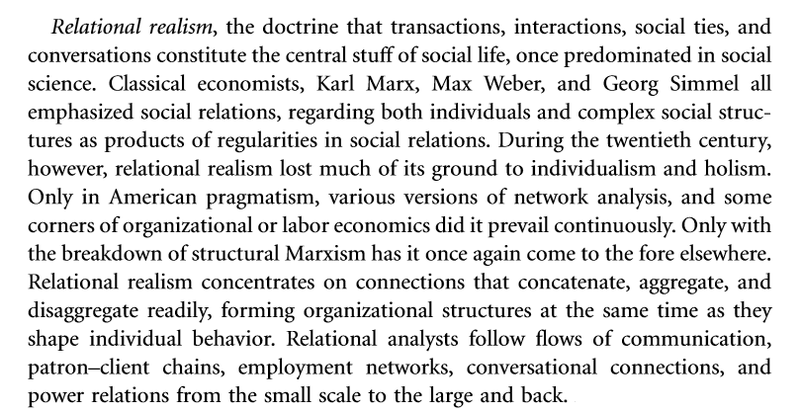 Max Weber, “Objectivity in social science and social policy”. Albert O. Hirschman, “The Search for Paradigms as a Hindrance to Understanding”, World Politics 22, 3 (April 1970). Panel abstract: The public sector remains an inescapable component of development policy, whether as an instrument of regulation, service delivery, redistribution or recognition. In an increasingly transnationalized world, public servants face a complex landscape of interactions with political regimes, civil society, the private sector, international organisations, academia, and their professional peers across the world; actors who advance competing agendas about how the public sector should think and behave, about what policy domains it should oversee or release. Moving beyond the relatively technocratic contours of the public sector reform agenda, this panel addresses the broader politics of public sector transformation: the everyday contestation of institutions, the resilience of organisational cultures, the role of policy entrepreneurs, or the growth of epistemic networks that blur the boundaries between state, society and regime. In so doing, the panel seeks to bring together theoretical contributions from political economy, contentious politics, organisation sociology, development administration, history, critical theory and international relations, harkening back to a time before academic disciplinary boundaries sequestered the study of public administration from politics and sociology. 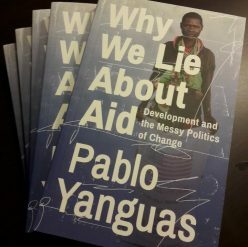 These theoretical contributions will be explored through empirical narratives of change and contestation from across the global South, from fragile countries with weak public institutions all the way to emerging economic powerhouses struggling with persistent informal legacies. The panel will place a particular emphasis on contributions addressing one or more of the following analytical sub-themes: Public entrepreneurs, Organisational change, Formal and informal institutions, Discourses about the state, Public sector advocacy, and Transnational influences. Next week begins the first full master-level module that I am teaching at Manchester’s GDI: Policy Analysis. It is a bit of an experiment, intended to supplement the governance and politics stream with a more applied kind of course. Putting it together has been an interesting challenge, as I wanted to mix key ideas from policy sciences, political economy, organizational sociology and development studies. Despite this mad objective, I think the final result is a coherent course on the politics of the public policy process. But in putting this together I have started wondering again where it all went wrong for the study of the state and public administration. Who are the key names in the literature about the politics of government? Max Weber was a lawyer, economist and historian who advanced sociology. Sammy Finer was a political scientist, expert on public administration and political historian. Charles Tilly, Theda Skocpol, Peter Evans – all of them sociologists who dabbled extensively in politics and history. Douglass North, economic historian and theorist who established the foundations for modern political economy. Robert Bates is a political scientist who also studied anthropology and economics. It’s as if you cannot belong to a single discipline if you want to advance the study of the state and public policy! And yet, 21st-century academia almost guarantees that scholars be sequestered in their ever-shrinking silos. At Manchester, traditionally the study and teaching of development has been separate from politics, economics or sociology (they even belong to different schools! ), and even within development politics and governance are confined to courses separate from economics and management. Then there’s me, putting together a course handbook spanning 4 or 5 disciplines. I must have been born 50 years too late! Still, I am hopeful about our ability to integrate the politics of the state and public policy in the mainstream of development studies, which is after all a hybrid discipline. Perhaps in time I will find accomplices in development economics and development management who also feel a bit constrained by academic boundaries. In the meantime, I am sticking to my guns with Policy Analysis and the political study of the state, the concept with no discipline.